The Hills Premium Laundry Trolley is a lightweight and durable unit that allows you to transfer your washing basket between your laundry and clothesline with ease. This unit is compatible with the majority of basket sizes, and prevents the need to bend down to your laundry basket, as the trolley situates your laundry basket at a higher level, allowing you to conveniently hang the clothes on the clothesline. The unit also features a high handle design, which allows for ease-of-use and comfortability when pushing the trolley, as well as an integrated peg basket to conveniently store your pegs. It is available in a stylish white and grey colour, with black non-marking, smooth slide and UV-safe wheels, which are suitable for use on most surfaces, including pavers and lawns. This product is not available at any Bunnings stores. Wish l had of bought it sooner, makes hanging out the washing so much easier and great quality. At last a laundry Trolly, that not only carries the load, but also saves your back! What a great design, I think most of us purchased our laundry needs, with the thought of will it do the Job? And not how well will it help me to do the job? Thank You Hills, The height great, Easy to manoeuvre, The only thing that would make it better is a basket that is designed to fit , one that won't dislodge when going up or down the steps. Charlotta Johnson. 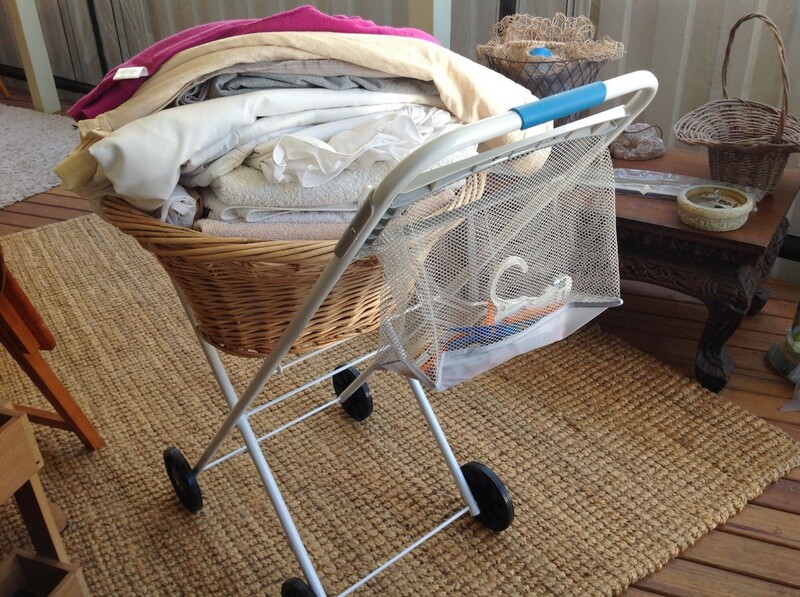 Love this laundry trolley. Great height so no bending. Best thing since sliced bread! I love my new trolley. Very easy to install, my teenager international student and I easily got it up and running within a few minutes. I love the high handle. But the show stealer for me is the built in basket. I use HEGS and these are big pegs.. so finally I have a basket that fits all my HEGS perfectly. So no more HEGS all over the ground. Love IT!!! Thank you team, speedy delivery on a super great item..
TOP SELLER - 2-3 full loads on washing!